Have you been to an amusement park recently? Once you get past the overcrowded parking lots, stand in line for tickets, (just to stand in line more once inside), and finally get to the roller coaster where people of all ages squeal in anticipatory delight, you’ll notice a small, sign at the entrance of every attraction. “You must be this tall to ride this ride.” There are no negotiations for those that don’t meet the requirements. No if’s, and’s or but’s. If you don’t believe me, try going with a 3-year old. You’ll be spending a lot of time in the petting zoo feeding animals that are “tame” and have that wonderful odor of oats, barley and whatever else is in the feed. No matter how much that 3-year old boy wanted to ride the roller coaster like the big kids, the staff were unwilling (and legally unable) to make an exception. In the job search, the same principle applies. You’ve got to meet the minimum requirements listed in job descriptions to even be considered for the position. From a recruiter’s perspective, minimum qualifications or requirements are the first phase of filtering out the clutter. Don’t meet them? Consider your application in File 13 (aka the trash). If they’re nice and have a little extra time (most don’t have the latter), your resume might get saved in the “other opportunities” pile for follow up. Target your approach. What is your end goal? Begin with this in mind. Entry-level jobs will help you gain experience that will be needed for the next position. Think about what you want to accomplish, have a plan, and execute accordingly. Targeting your approach will give you better direction and in the end, can prove to be very beneficial! Know if you’re qualified. Minimum qualifications – do you have 10-15 years of experience in the field relevant to the posted career opportunity? If you don’t, don’t apply! Know your qualifications. If you have 9 years when 10 are preferred, you may have a shot. But, if you just graduated college and have applied for an opportunity that lists 5+ years of experience as a prerequisite, chances are that you’re not qualified. Also, pay special attention to the location requirements. If the position is in New York, China, or Arkansas, don’t expect that you won’t have to move there. You will. That’s where the job is based, not just where you are comfortable living. This applies to many positions, but there are some exceptions. Check these things before you apply. If you’re not qualified, know what to do. Not qualified for the position you’re interested in? What can you do? You could look at it this way: think of the job as a goal to achieve. With the right knowledge base, skillset and experience, you can become qualified in the long run. Right now, know what you need to do to gain that knowledge. Research the field, job shadow with people in that position, gather information from following industry-related blogs, reading trade publications, or simply networking with the right people. Do what it takes to establish yourself as a credible person of authority and qualified candidate. Target your approach, know if you’re qualified, and know what to do if you’re not. These are three steps to help you land the job of your dreams. Recruiters are ordinary people, too. Most read through thousands of resumes just to find that perfect candidate. Help them help you by applying for the positions you’re qualified for. If you don’t know if you’re qualified, ask someone. There are a ton of career experts out there offering free and fee-based services and advice if you just ask. Some good ones are listed in my blogroll to help you if you need it. The amusement park metaphor can be applied to your career and life in general. Life is a roller coaster – exciting and scary at the same time, leaving us with a feeling of exhilaration and an adrenaline shot to get us through the next drop or upside-down loop. Principles for roller coasters and the job search go hand in hand. Knowing your qualifications and how to apply them will help you find the best fit at the right time. 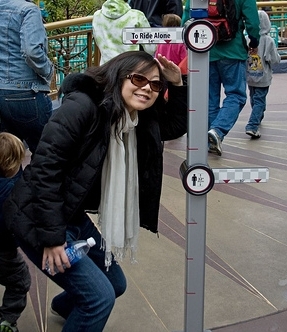 So, here’s the question: Are you tall enough to ride?